Environmentally friendly and cost-effective energy supply is one of the great challenges of the future . People have to find a better economic ,clean ,renewable energy , this is very important for the future energy demand .At present , solar energy and wind energy etc. green energy are already a fast-growing world market. Solar electric power is a 100% renewable energy source. It provides the advantages of other distributed generation systems without dependence on fossil fuels. Solar power produces no emissions and no noise. As a result, it can be easily sited in densely populated urban areas on rooftops, parking structures or on the ground. 2. Photovoltaic power generation has economic advantage: from the building cost of photovoltaic power station, with the large-scale application and promotion of solar energy photovoltaic power generation, especially the gradual maturity of upper crystalline silicone industry and the photovoltaic power generation technology as well as the composite development of building roofs and exterior walls, the building cost per kilowatt photovoltaic power will probably be RMB 7,000-10,000. Compared with other renewable energy resources, it has the same economic advantage. 3. The photovoltaic resource content is as high as 96.64%: from China’s developable resource content, the scholars and experts acknowledge that the bio-energy is 100 million kilowatts, the hydraulic energy is 378 million kilowatts, the wind energy is 253 million kilowatts and the solar energy is 2,100 billion kilowatts; 21 billion kilowatts of power can be obtained if 1% of the solar energy is developed. In the aspect of scale, the bio-energy takes up 0.46%, wind energy 1.74%, hydraulic energy 1.16% and photovoltaic power 96.64%. 4. The carbon emission is almost zero and free of pollution. Without calculating the upper links, the emissions of various power generation types are as follows: coal: 275g, oil: 204g, natural gas: 181g, wind energy: 20g. However, the carbon emission of solar energy power generation is almost zero and there is no waste residue, waste materials, waste water, waste gas, noise or materials harmful to human during the power generation process; thus it is free of pollution. 5. Minimum and most direct conversion links: from energy conversion routine, solar energy power generation is to directly converse solar radiation to power, owning minimum and most direct conversion links among renewable energy resources. 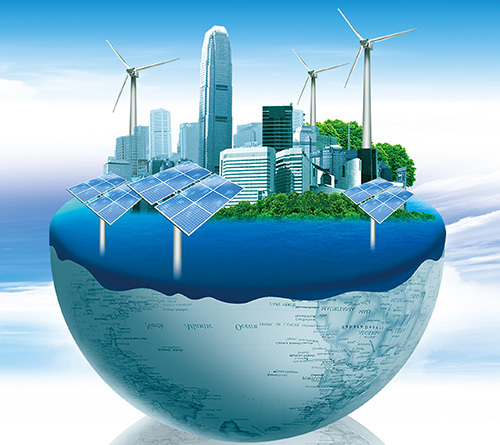 Generally speaking, in the energy flow of the whole ecological environment, with the increasing of the conversion links and expansion of the conversion chain, the energy loss will increase geometrically; at the same time, the operation cost and instability of the whole system will be greatly increased. Until now, the practical conversion efficiency of crystalline silicone solar energy battery is 15%~20% and the highest experiment level has reached 35%. 6.The most economical, cleanest and most environmentally friendly: seeing from the resource conditions, in particular land use point of view, bio-energy, wind energy is more harsh, but solar energy is very flexible and extensive. We say that of solar power occupies 1area of the land that wind is 8-10 times than solar, and bio-energy can reach 100 times. However, the water electricity, the completion of a large-scale dams often require tens to hundreds of square kilometers of flooded land. In contrast, solar power do not need to occupy more of additional land: not only roof, walls can be the venue for their applications, but also the use of our vast desert, through the construction of solar power base in the desert can directly reduce the direct radiation to the surface of the solar, effectively reduce the surface temperature and evaporation; thereby, enabling plant survival and growth to a certain extent possible, also secure and reduce the sand dunes, besides, we also be obtain clean and renewable energy that we need from nature. It can be seen, solar photovoltaic power is the most economical, cleanest and most environmentally sustainable energy that we can use now. Sinosola is proud to offer high quality service and support to our customers. If you do not find answers to your questions below, please contact us directly. These systems are connected to a larger electrical grid. During the day, the solar electricity generated by this system will be used immediately or sold to electricity supply companies. At night, the system can not be real-time supply, and you can buy back electricity from the grid. These systems are used independent from electrical grid, and can also be used to power supply of radio relay stations, telephone booths and street lighting. In ship and leisure convertible market, the mobile photovoltaic technology market is constantly evolving. Off-grid (also known as stand-alone) solar systems supplies a more economical power for developing countries, where their conventional electricity is unstable or incomplete. Sinosola can design and started design from factory built . of course ,included on-grid solar system,off-grid solar system , solar kit, solar street light etc. please contact with us directly for details. 1. What is solar photovoltaic (PV)? Photovoltaic means electricity from light. A solar PV system uses the natural energy from daylight in the form of solar radiation to generate electricity. This is different technology to solar thermal systems used for heating and hot water. By installing a solar PV system you will be generating your own clean green electricity from the free energy of the sun. This will not only reduce your electricity bills but since energy use associated with buildings accounts for around 50% of the CO2 emissions, installing a PV system will also help reduce greenhouse gases. Solar PV systems are most commonly made from silicon, the second most abundant element in the planet crust, usually in crystalline form. The modules (sometimes referred to as a “panel”) are made from PV cells usually behind glass that are linked together in series like batteries in a torch to generate power output in the form of direct current (DC). A number PV modules can be connected together to give the desired electrical output. 8. Where can I install a PV system? 9. Do I need planning permission? Some authorities require planning permission especially for listed buildings or within a conservation area. 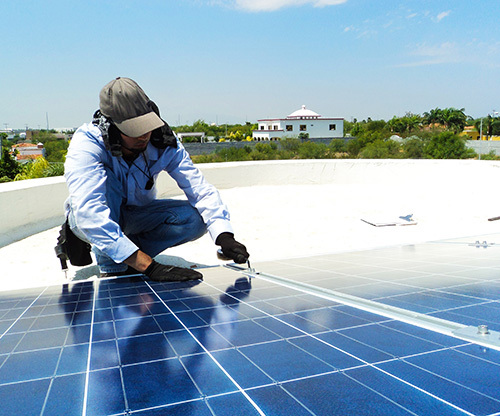 Although planning permission for solar PV is not generally required, Sharp recommends that customers should always check with their local authority before having a system installed. 10. How much will a system cost?